Supers (as they’re known here) are still illegal, and The Incredibles who used to save the day are left to deal with the path of destruction they’ve left behind fighting the bad guys. But the eccentric head of a telecommunications firm (voice of Bob Odenkirk) has a plan to change that. He wants to give supers a dose of good public relations by installing cameras in their new super suits so the world can see their heroic feats in action. 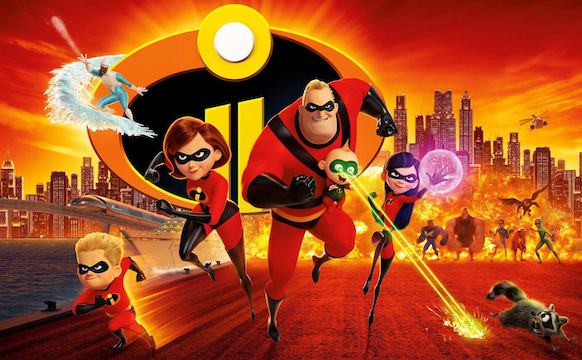 So The Incredibles Mom, Elastigirl (Holly Hunter), is the one who’s front and center in this new PR campaign. That leaves Mr. Incredible (Craig T. Nelson) in Mr. Mom territory, left home caring for the kids which include Violet (Sarah Vowell), who is upset about her dad’s government handler erasing the memory of a boy she liked, Dash (Huck Milner), and little baby Jack Jack, whose untold powers were only hinted at in the first movie.